So, you've just bolted on a set of those big bad rims that have everyone turning heads. There's just one problem, though - all that extra space between the spokes is showing off your ugly, dusty factory brake calipers. You could drop a small fortune on a set of aftermarket brakes, or make a big mess out of trying to paint your calipers. Your best bet, though, is to drop in some MGP Brake Caliper Covers. MGP Caliper Covers aren't your average cheapo tape-on plastic covers. They're built from top-shelf 6061-T6 aluminum, with a tough powder-coat finish that withstands all kinds of abuse and comes in a variety of colors. CNC engraving adds an extra-custom touch that really takes your style to the next level. Speaking of custom, every cover is designed specifically for your year, make, and model, ensuring a perfect fit and the sleekest style. MGP's patented clip-on fastening system ensures a reliable fit and an easy installation. 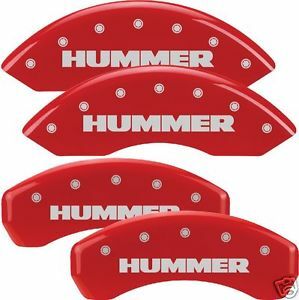 Take your vehicle's style to a whole new level with rugged custom MGP Brake Caliper Covers. Backed with a 3-Year Warranty.